BEAR Data has partnered with Cisco, a worldwide leader in networking, to help transform how people connect, communicate and collaborate. This channel will host webcasts that share our knowledge, experience, and trends on what technology solutions could work for you. Cisco Systems and BEAR Data Solutions have years of experience helping clients like you decide what the best, well-performing and cost-effective solution is the right choice for your private and/or public cloud environment. Since these companies know a thing or two about the Data Center, we are inviting you to a 45-minute, information rich webcast on April 4 from 10:00am – 10:45am that will cover key trends and product developments that are important to organizations in any vertical market like legal, finance, software, manufacturing and others. 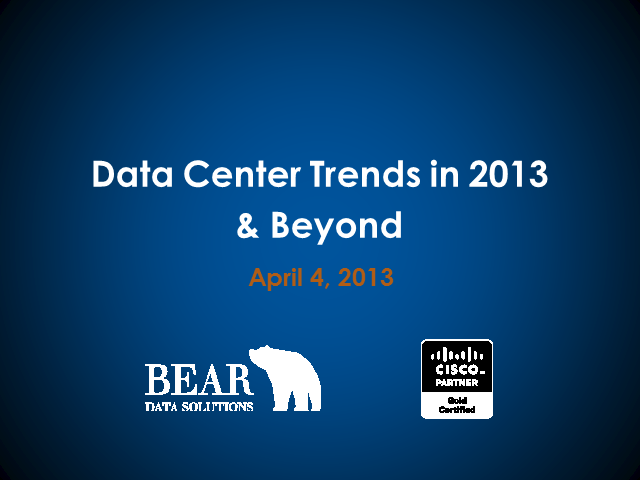 We’ll be discussing strategies to take advantage of these trends and stay ahead of the curve!